Pallet delivery to Portugal has never been as simple as it is with National Pallets. Whether it’s simply a few boxes or a large piece of machinery, we can provide you with a safe and secure pallet delivery service to and from Portugal. Using our consignment tracking facility, you can even track the pallet from the minute it's collected to the minute it's delivered. 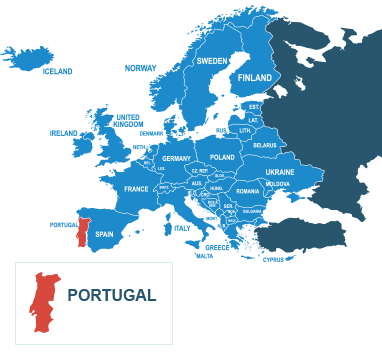 If you require expedited pallet delivery, Portugal can be reached in 2 days using one of our premium service options. Today, the country has a 68,732 km (42,708 mi) road network, of which almost 3,000 km (1,864 mi) are part of system of 44 motorways. Opened in 1944, the first motorway (which linked Lisbon to the National Stadium) was an innovative project that made Portugal among one of the first countries in the world to establish a motorway. Due to this vast infrastructure, Portugal was a leading member in shaping the roadway systems that we see today, helping transport our international pallet deliveries. Why not check out all our pallet delivery services from the UK to Portugal? Simply request a free instant online pallet quote by using the quick quote option on the right and send a pallet to Portugal today! Do I need to deal with customs when shipping pallet from the UK to Portugal? No. As Portugal is a member of the European Union, you don't need to worry about dealing with international customers when shopping your pallet. How much does it cost to send a pallet from the UK to Portugal? We are able to ship the majority of goods to and from Portugal, however there are some exclusions, these are listed below.